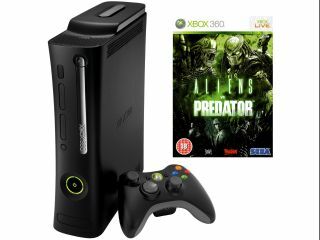 Alien Vs Predator and Xbox 360 Elite to be won! Some things just go together. Ant and Dec, strawberries and ice cream, Mitchell And Webb… but none can compete with the awesomeness that is Alien Vs Predator. Made by the same team responsible for the original 1999 classic, Alien Vs Predator is an all-out action game with a difference. You can choose three different ways to play the game: as marine, alien or predator. Not only does this mean that you get some brilliant intertwining story arcs, but there's a three-way online multiplayer option available. And, to add a little bit of movie magic to proceedings, Lance Henriksen reprises his role as Bishop so those who love the Alien movies are going to love this first-person monster mash. To celebrate this almighty videogaming clash of the monster titans, TechRadar is happy to announce that it has an Xbox 360 Elite to give away, alongside an Xbox LIVE 12 month Gold subscription and a copy of Aliens Vs Predator to give away to one lucky reader. Not only that, five runners-up will get a copy of Aliens Vs Predator on the Xbox 360 too. The Winner of the Xbox 360 Elite, Xbox LIVE 12 month Gold subscription and a copy of Alien Vs Predator is James Chaney. The runners-up who each receive a copy of Aliens Vs Predator are: Sam Birkinshaw, Hayden Westfield-Bell, Derek Briggs, Phil Brassington and Mr Johnson.